Mala beads are used when chanting, repeating mantras, or the name of a deity. They are also used to focus your mind during your meditation. The word “mala” comes from the Sanskrit word for garland. The earliest traces of mala beads dates back to at least the 3rd century BCE. However, it is said that Buddha himself gave us the instructions for their use. There is a sutra (teaching) that tells us that there was once a king who prayed extremely hard to Buddha for a simple way to help ease his suffering from all the difficulties he faced. Buddha responded by telling him to get 108 soapnut seeds, string them together and to recite a three-part prayer upon them. 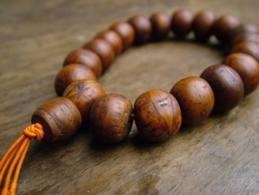 As stated by Buddha, mala beads have 108 beads, are made from the seeds or certain plants, such as sandalwood and lotus. They can also be made from precious and semi-precious stones. My personal mala is made from rose quartz. The beads can also come in different sizes from 8mm to 12mm. The mala has a “sumeru” or head bead, which usually has a tassel of some sort. You would start your mantra or chanting with one of the beads next to it, touching one bead for each repetition of the mantra. This is normally done clockwise, but counter-clockwise is also acceptable. You can also just simply hold the mala beads in your hands while you are meditating, focusing on your breath. The smaller malas of 27 beads can be worn on the wrist on a daily basis, as a sign of devotion. The larger malas of 108 beads can be worn as a beautiful necklace, or wrapped just around the wrist; and if you wish, then wrapping it down around your middle or ring finger. It is thought that the more you hold and/or wear your mala, that it will pick up your vibrational energy. Mala beads are simply prayer beads, not much different than the rosary in Catholicism. 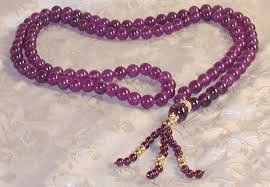 Prayer beads are also used in Islam, Sikhism, the Bahai Faith, all of them having varying amount of beads. If you are going to start a meditation practice, or have one already in place and would like to begin chanting, I highly recommend getting a mala, taking your time to find just the right one for you alone. I do not recommend buying them online as you should hold them and see which one calls out to you; that is the one you should get. They can be found in stores that specialize in Indian products, as well as some metaphysical stores.